Hot mum on the block, Malaika Arora Khan almost never fails to make the best-dressed list and is known for always looking ramp ready. As she turns a year older today, we examine her style quotient. Hot mum on the block, Malaika Arora Khan almost never fails to make the best-dressed list and is known for always looking ramp ready. The diva doesn’t shy of showing off her petite frame in mini dresses, maxis or stunning evening gowns. As she turns a year older today, we examine her style quotient. Malaika Arora Khan oozed oomph in a black backless Michael Kors gown with a plunging keyhole neck. She finished off her look with an amrapali ring that provided just the right amount of shine, a headband and a box clutch. Malaika simply nails the jumpsuit look – While she wore the black Wendell Rodricks creation to an event, the pale rose coloured jumpsuit saw an outing to the ‘Piku’ success bash. The cutouts at the side give a glimpse of just the right amount of skin. Not one to shy away from prints; Malaika showed us how to wear fully printed outfits without coming across as looking too busy. Malaika was a dream in this soft palette flowing maxi dress by Pernia Qureshi. A casual night-out on the town saw Malaika in a black-cropped top with enviable snake-print palazzos. Malaika carried off this monochrome look with ease – a cropped top and black palazzos paired with the right accessory – red lips. 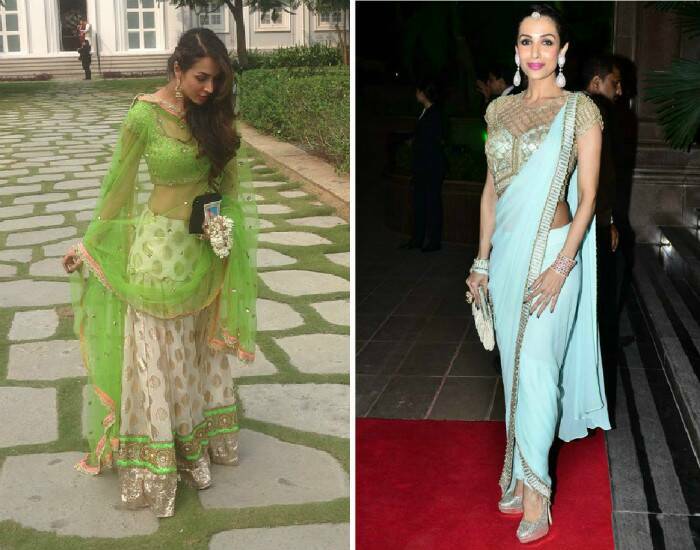 No doubt Malaika always gets it right when it comes to western wear, but ethnic outfits are no different. For sister-in-law Arpita’s wedding last year, Malaika looked gorgeous in a green and gold lehenga that showed off her toned midriff. The grand reception saw Malaika in a stunning blue and metallic Sonaakshi Raaj creation with bright pink lips. While Malaika opted for beautiful colourful outfits for festive and celebratory occasions, the dancing diva picked an elegant black sari for a design event, pairing her look with stunning gold jewellery. A red carpet occasion saw Malaika in a rich champagne coloured Rama Al Ali gown. For a women’s power fiesta in the city, Malaika was easy breezy in an olive green maxi dress that perfectly complemented her skin tone.